This year’s AHR Expo promises to bring the entire HVACR industry together to see the latest products, technologies, and trends that are shaping the future. This is the first time in six years the show is anticipating more than 60,000 professionals and 2,000 exhibits, with a wide range of educational sessions. The show will run January 25-27 in Orlando, Florida, and will cover over 400,000 square feet of exhibit space. Registration is free to qualified professionals if you register in advance, otherwise the fee is $30 after the cutoff and onsite. Spanco will be one of the material handling exhibitors at this year’s AHR trade show, where we will kick-off a new 15’ x 20’ booth featuring two of our most popular material handling solutions: an Aluminum Gantry Crane with pneumatic wheels for excellent floor protection and ease of movement and a Freestanding Workstation Bridge Crane. The Aluminum Gantry Crane was included to highlight the system’s portable efficiency and flexibility, and the Workstation Bridge Crane was temporarily installed to demonstrate the enclosed track and ease of bridge/trolley movement. This year’s exhibitors will be displaying the most advanced products and technology in the industry. 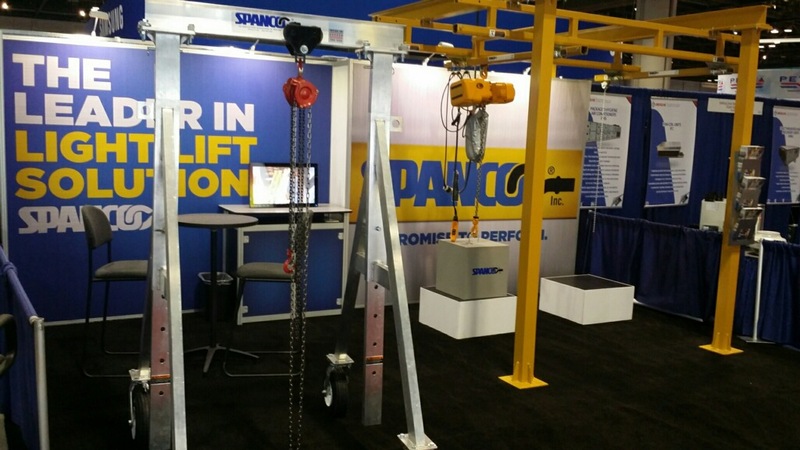 For the HVACR industry, Spanco is excited to showcase the Aluminum Gantry Crane, which is highly portable, cost effective, and lightweight. It can be easily assembled and disassembled in minutes and moved with one worker. HVACR professionals can disassemble the system, throw it in the back of a service truck, and take it from one job site to another with ease, making it ideal for rooftop heating, ventilation, air conditioning, and refrigeration applications. To learn more about the AHR Expo trade show please visit them online at www.ahrexpo.com. We look forward to seeing you there!